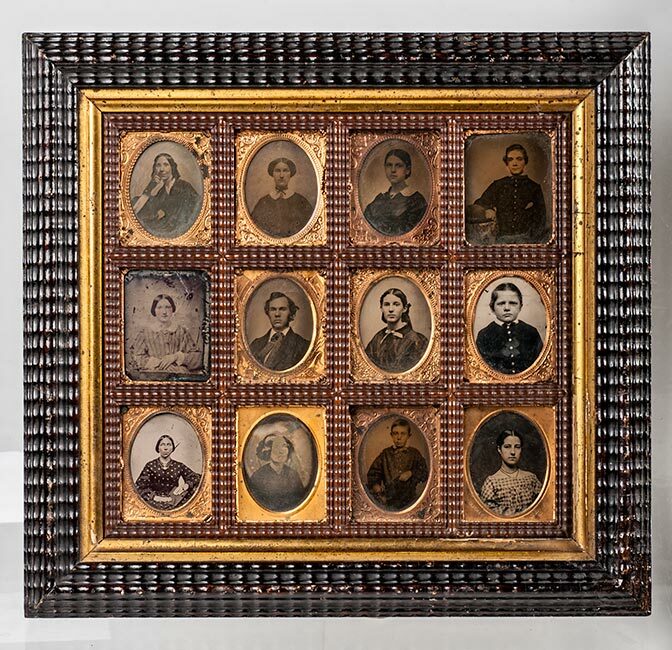 The Picture Frame Museum is a group of pieces that excell in rarity and design. 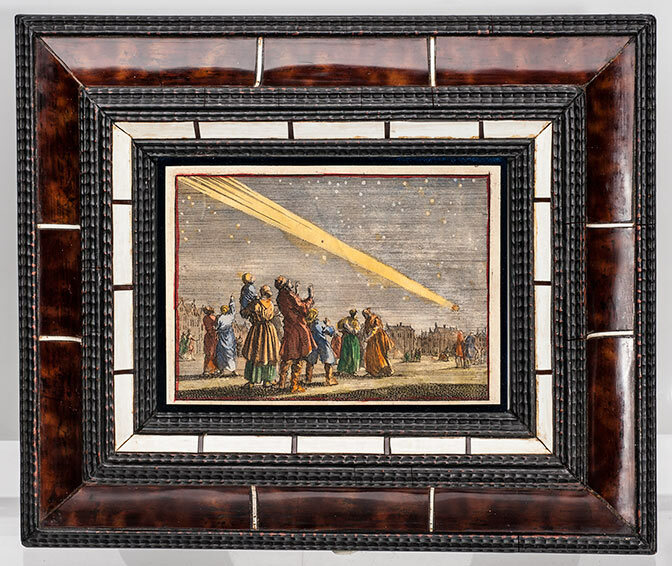 These are, for the most part, not the gilded frames that surround paintings in museums. 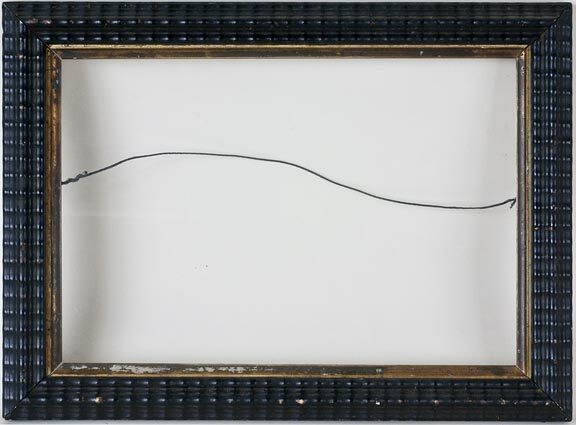 These are the frames that were made by talented framemakers from the early 1800s to the Art Deco 1930s. 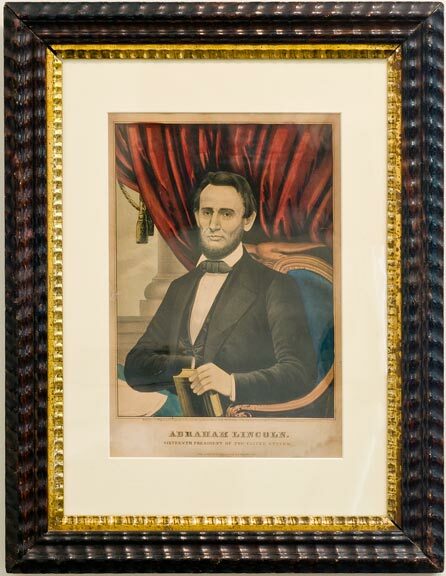 I began to collect old frames years ago when I wanted to display pieces in my collection. I didn't want new frames that had no historical connection with the pieces being framed. 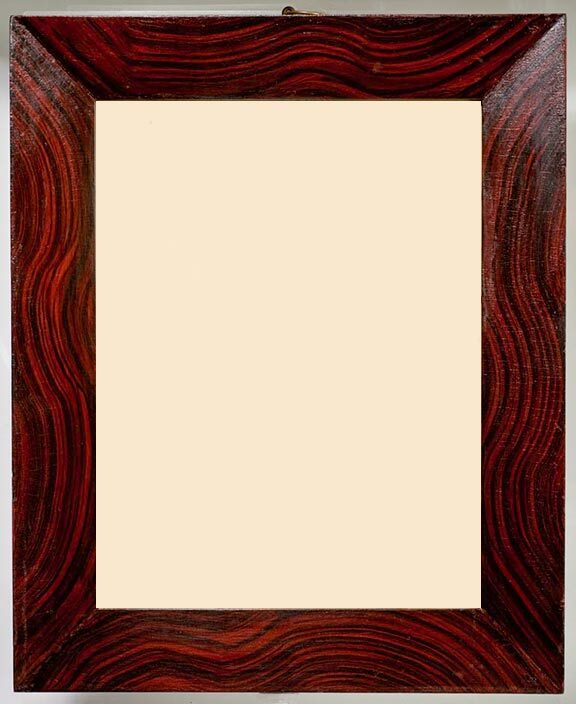 In my research, I found very few books that illustrated wood frames that were painted to resemble expensive woods, others that used oak and walnut, and some with gesso designs. 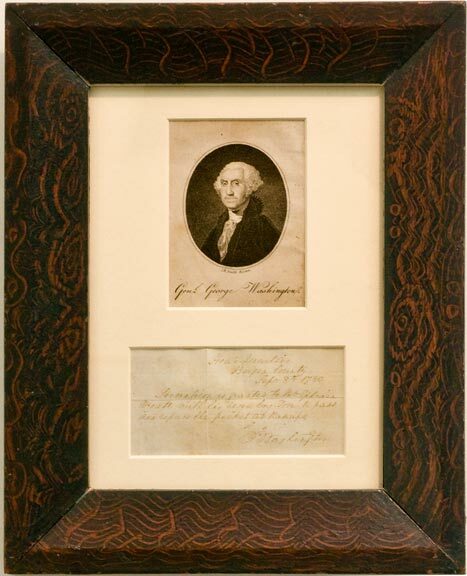 I wrote Collecting Photo and Picture Frames to show hundreds of great American (and a few European) frames. 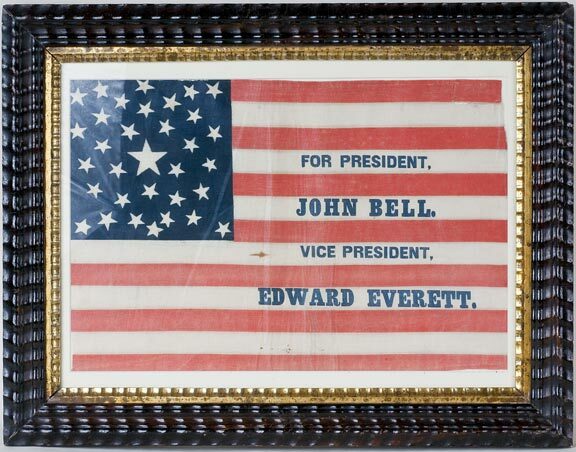 A 1920s sign from a photographer who also dealt in picture frames. For a frame collector, it is always nice to collect a few go-withs. 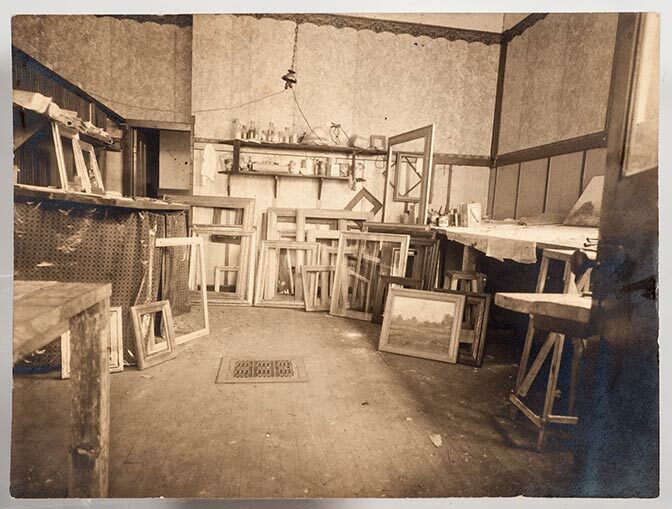 A 1910s photograph of the interior of a picture framing shop. 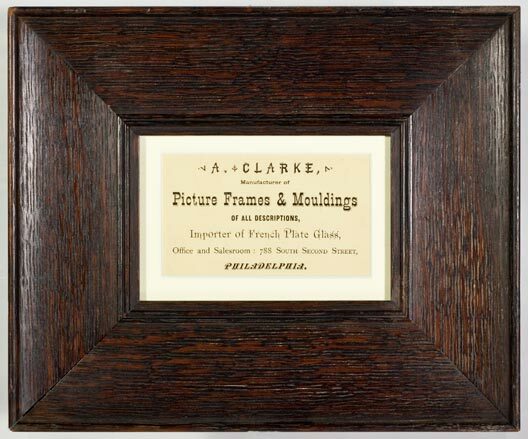 An 1880 trade card for a framer working in Philadelphia, mounted in a ca.1910 Mission oak frame. 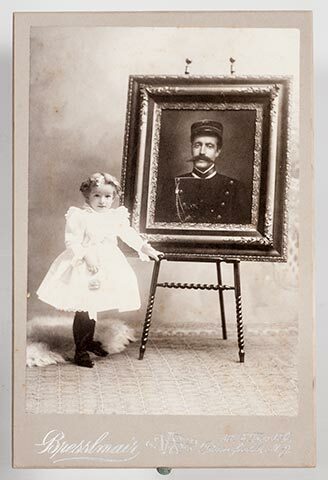 1880s-90s photo of a child with a framed painting of a soldier. 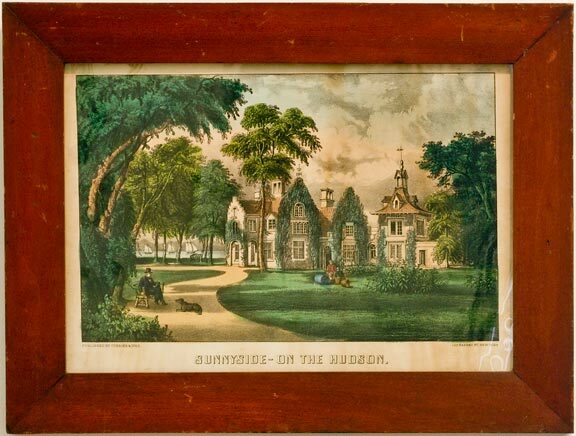 Typically, Victorian homes created many surfaces to exhibit photos and paintings. 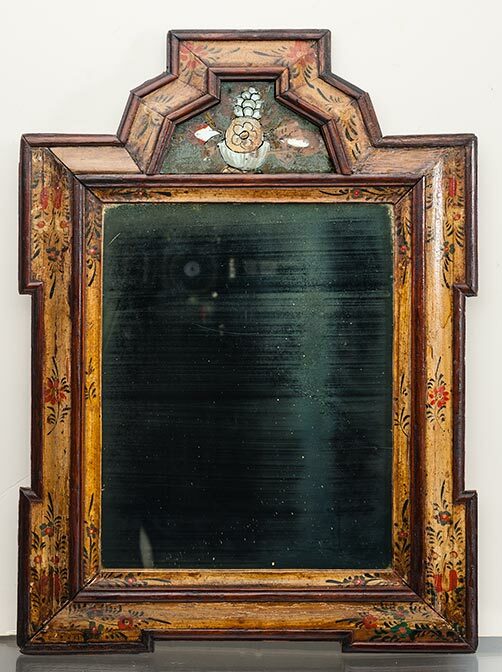 Best - A ca.1770, a European Courting Mirror with a hand-painted design of flowers w/reverse painted glass insert. Great original finish and old mirror. It is 12 1/2 x 17 1/2 inches od. and has a 8 1/2 x 10 3/4 inches image size (rabbet). 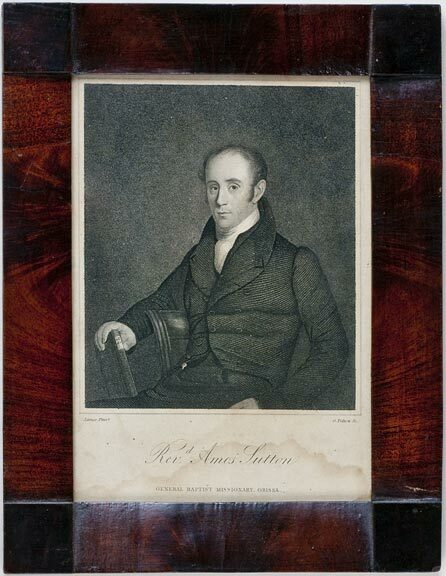 Better - An 1820s simple wood example made by a talented furniture maker. American frames of this age are nearly impossible to find. It is 11 1/8 x 22 1/4" outside dimension. Best - An incredible (the natural tiger strip maple has translucent shimmering stripes with depth that change as you move around it) from the 1830s-40s. It is 8 5/8 x 10 3/8" od. 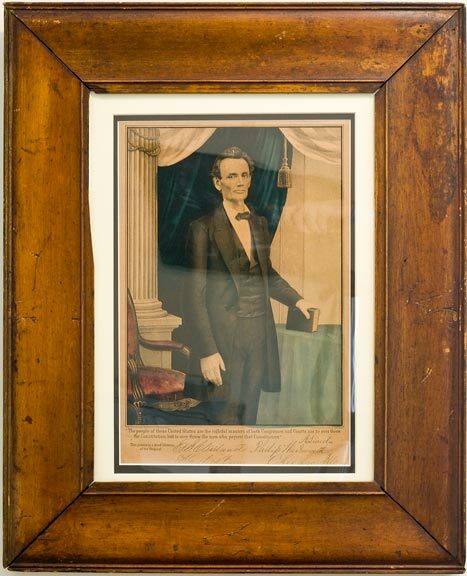 and a 6 1/4 x 8 inch picture size Best - An 1830s Very nice Philadelphia birdseye maple. 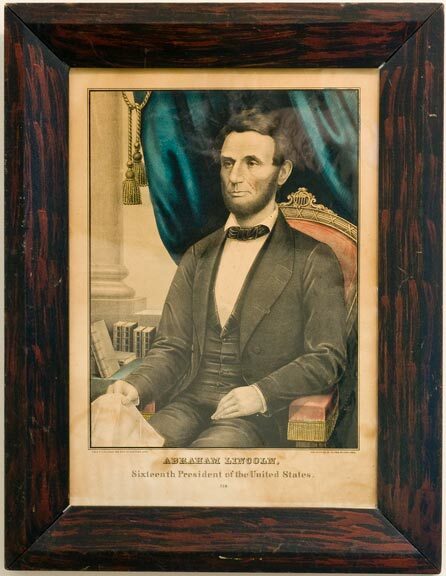 American frames of this quality are nearly impossible to find. It is 9 3/4 x 11 1/2" od, 6 1/4 x 8" inside. 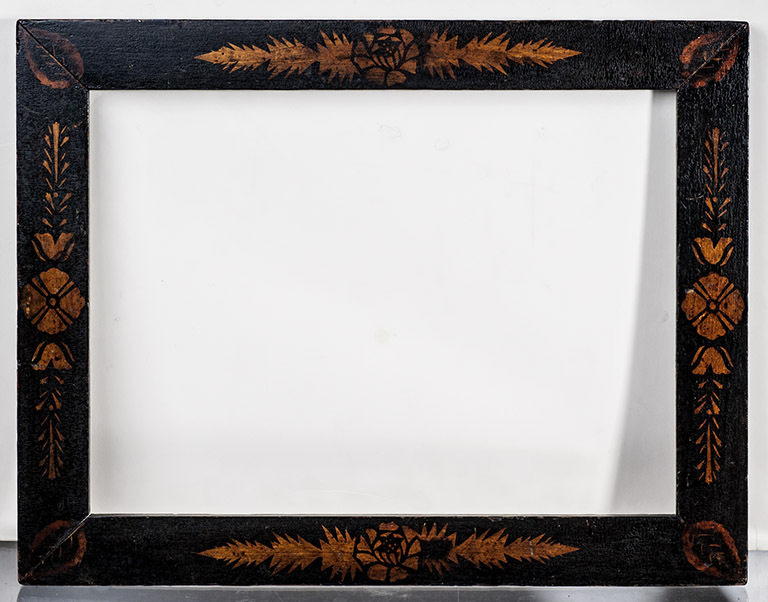 Best - An 1840s Toleware/stencil pattern frame with flowers and leaves. This is the first and only example of this type of decoration that I have found. It is 14 3/4 x 18 3/4 inches od. and has a 12 x 16 inches image size (rabbet). 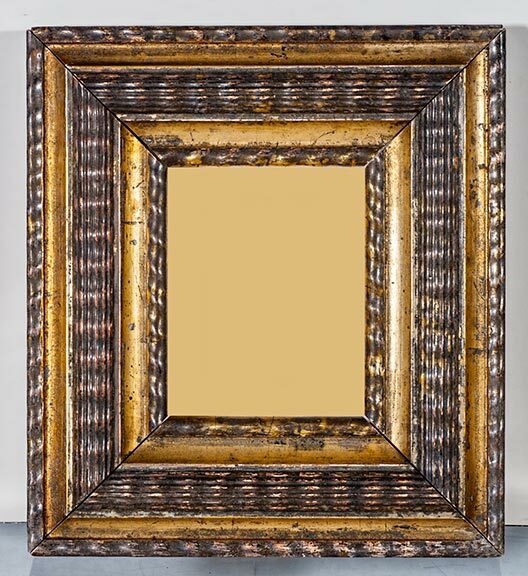 Best - A very rare and beautiful, 1840-50s unusual ripple ogee frame with gold liner. This is not a painted finish, but a burl veneer on the piece. It is 13 1/2 x 15 1/4 inches od. 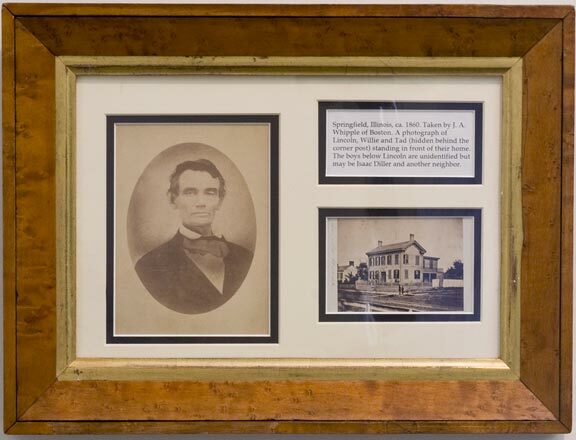 and has an 8 x 10 inches image size (rabbet). Best - An 1830s walnut and brass piece from France. It is 6 x 6" od. I was lucky to find a pair of these. 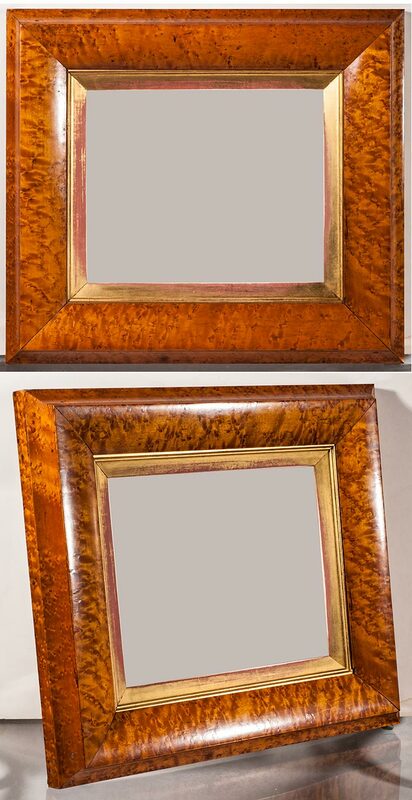 Better - A rare pair of gold-wash, thin, brass over wood examples with period silhouettes from 1830-35. They are 4 1/4 x 5 1/4" outside and 3 1/4 x 4 1/4 pic. size. 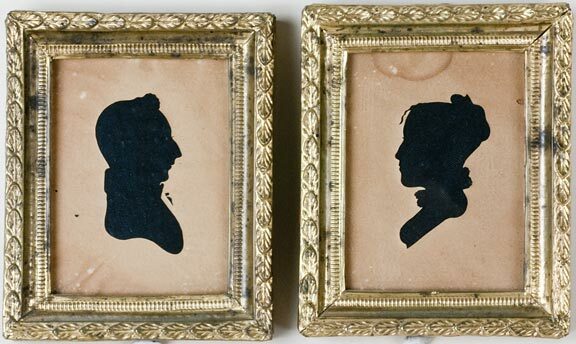 These hang on my wall with a faux bois, 1835 frame surrounding them. Best - This is among the highest quality, blocks-in-corner (we now refer to these as Hick's style) mahogany veneer piece that I have ever found. It dates to 1829-1835. 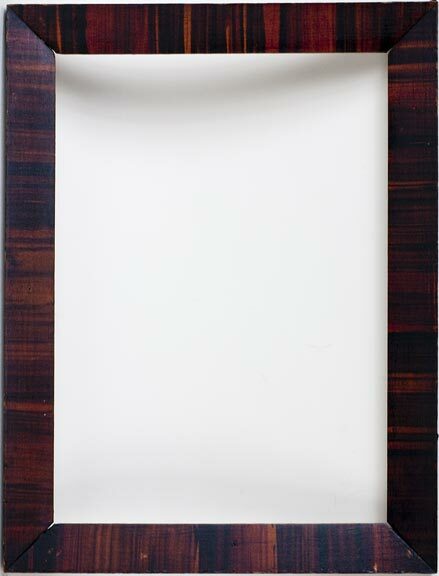 It has a high quality mahogany, tapered surround and wood blocks in the corners. It is 14 x 18 inches od. and has an 10 x 14 inch picture size. 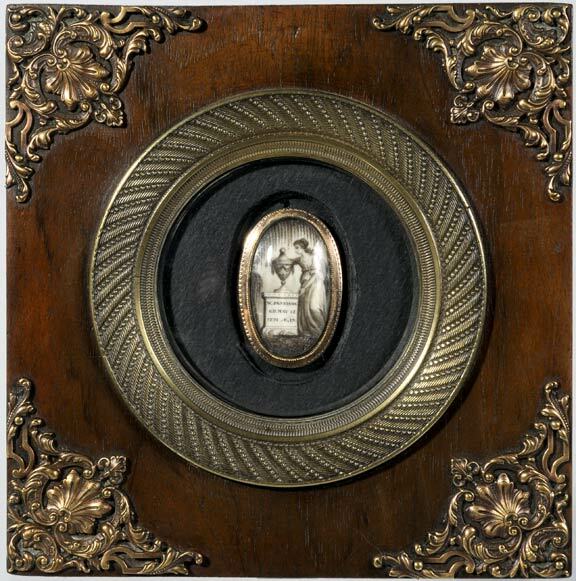 Best - A beautiful, mother of pearl and gold on black paper mache from 1840-1850. Believed to be English-made. It is 9 1/4 x 10 1/4 inches, inside 5 1/2 x 6 1/2 inches, image sight 3 1/2 x 4 3/4 inches. The center panel is removable with the glass. Good - A very simple painted, grooved wood from the 1830s. 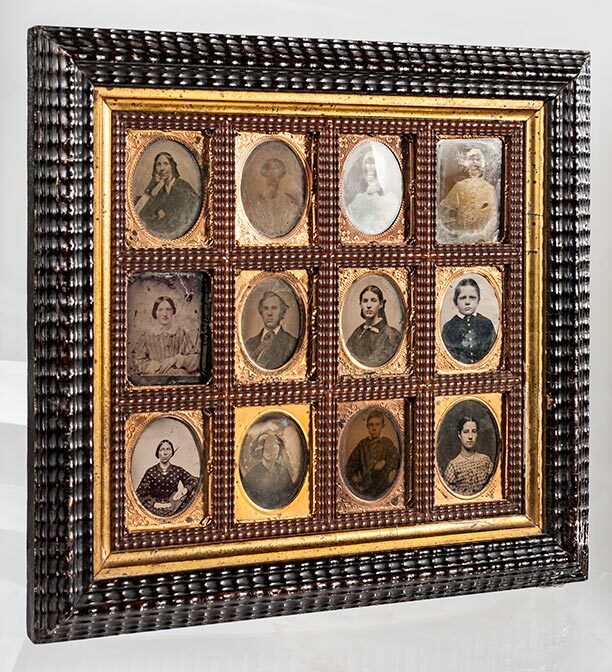 If you are out hunting frames, look closely at any of these grooved frames. They are generally on the smaller size and should show their age. It is 7 1/8 x 8 5/8" od. Better+ - A nice, early birdseye (also called Curley) maple from the 1830s. It is 10 1/2 x 14" od. 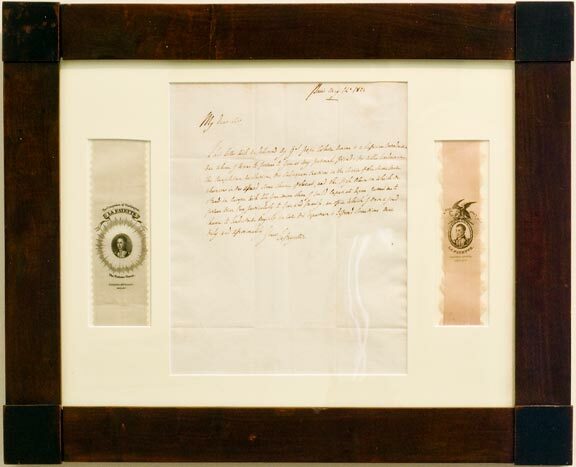 Best - A rare and large birdseye maple veneer from the 1830s. It is 20 1/8 x 22 1/8" outside and 15 x 17" inside. 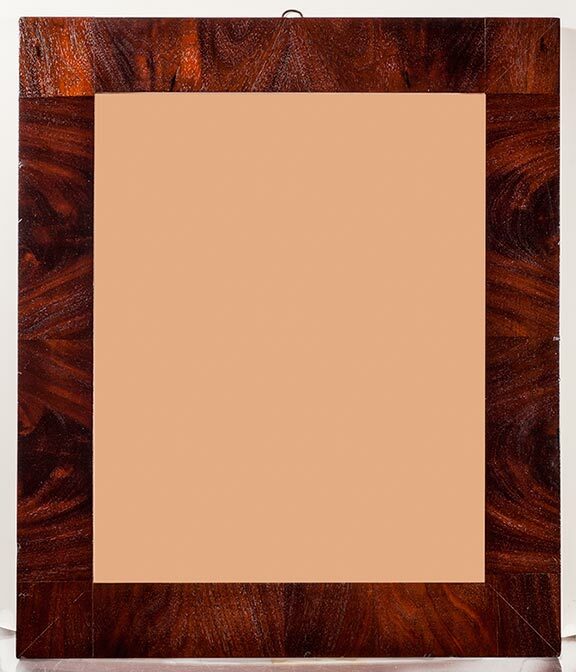 Better - A small birdseye maple veneer from the 1830s or earlier. This is probably an English frame. It is 7 3/4 x 9 1/4" od. Best - A beautiful Quilted maple-patterned piece from the 1830s. The slightly rounded corners and raised rim are nice embellishments. It is 14 x 17 3/4" outside and 9 1/4 x 13" inside. Best - A beautiful birdseye maple veneer from the 1840s. It has depth, the finest birdseye maple, and is in superb condition. It is 17 x 19" outside and 9 7/8 x 11 7/8" inside. 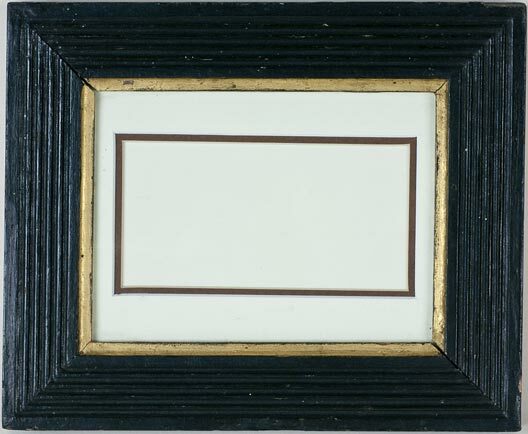 Best - Rare, hand painted faux bois frame with corner blocks (Hick's style), ca.1835-1845. It is 14 3/4 x 16 7/8 inches od. and has a 12 x 14 inch image size. 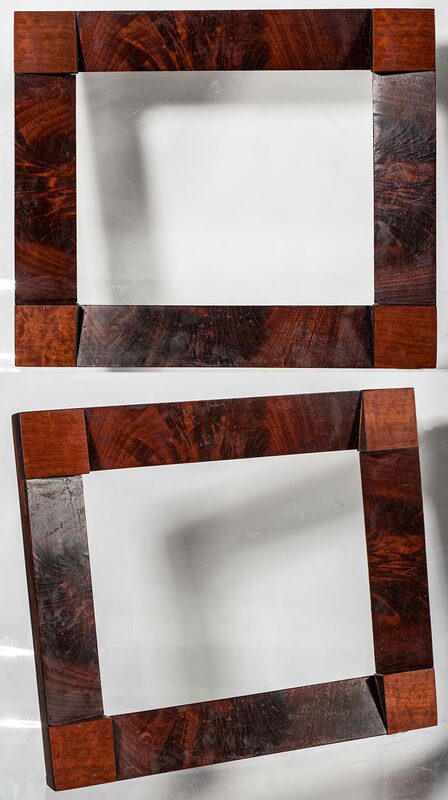 Best - This and the one to the right are rare overlapping corner construction, mahogany veneer pieces, with Hick's style frames that date to 1829-1835. It is 6 1/2 x 8 1/2" outside and 4 7/8 x 6 3/4" image size. 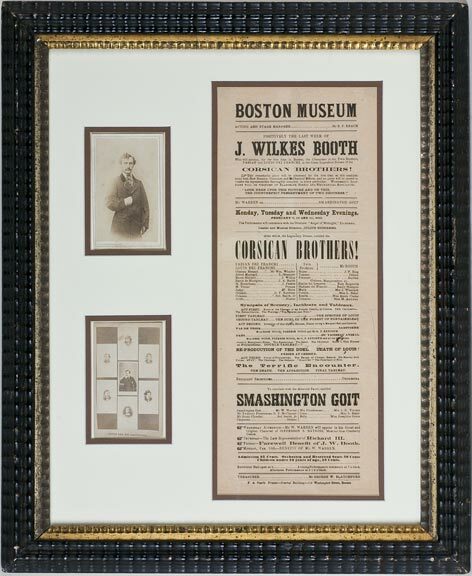 Good to Better - A nice, early, ca.1835, Hick's style (blocks at corners) example. The above one is 13 1/2 x 16 1/2" outside and 10 1/4 x 13 1/2" inside. 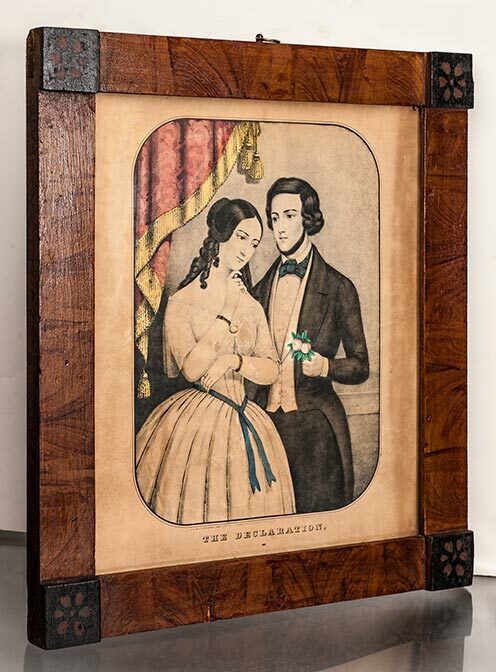 Better to Best - This is a rare Hick's style, mahogany veneer piece, that date to ca.1835. It is 16 x 19" outside and has an 12 x 15" picture size. Best - An early (ca.1835) Hick's style (blocks at corners) example with a maple or pine surround. It is 14 1/2 x 18 1/2" outside and has an 10 x 14" pic. size. 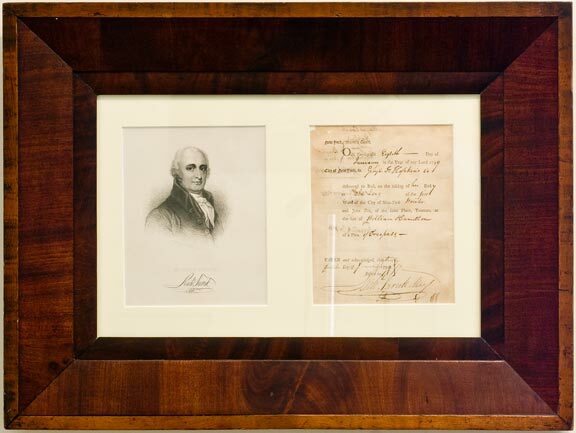 Best - A beautiful Hick's style, high quality, mahogany veneer piece that date from ca.1835. It has sloping sides and wood blocks in each corner. It is 11 1/2 x 13 1/2" outside and 8 x 10" picture size. Best - An exquisite and rare Hick's style tiger maple (the natural tiger strip maple has translucent shimmering stripes with depth that change as you move around it) example that date to 1829-1835. It has wood blocks in each corner. 12 x 15" outside dimensions, 10 x 13" image size. 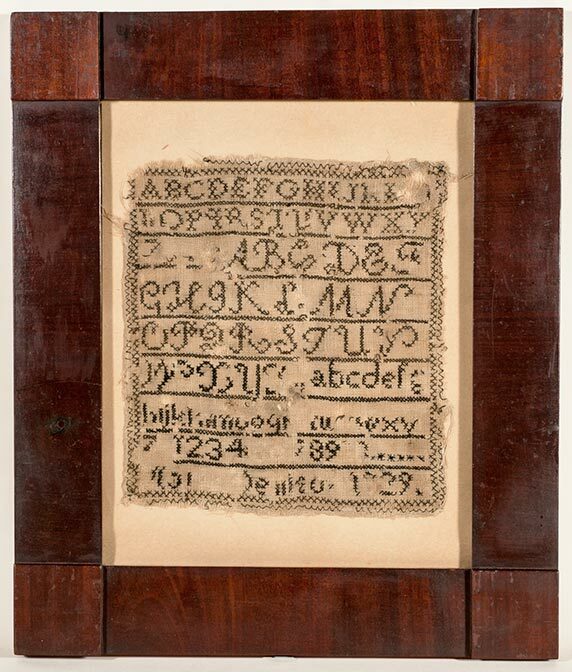 Better - A middle grade, mahogany, blocks-at-the-corner style piece dating to the 1830s. It is 12 1/4 x 14 1/2" outside and has a 9 x 11" picture size. 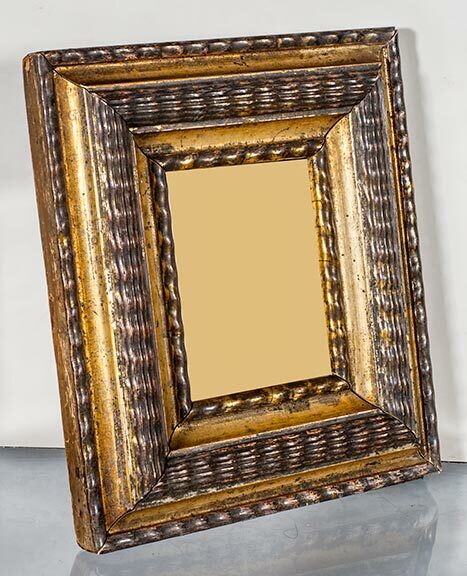 Best - 1835-40 weathered gold with complex inner frame. 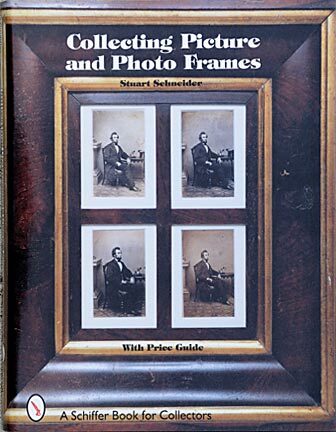 It is 10 1/4 x 11 1/2", inside 5 1/4 x 6 1/2" image size. Best - This is a rare piece. 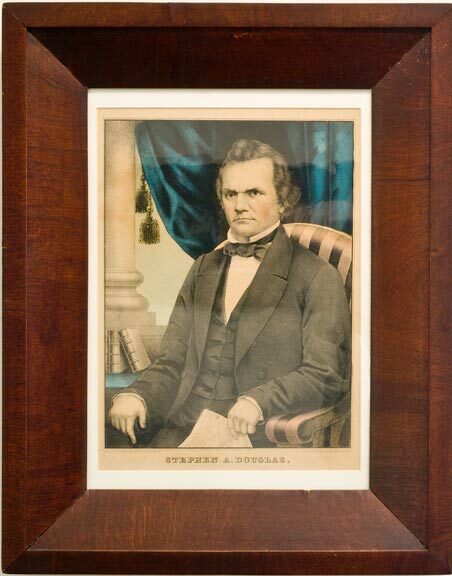 An 1838 black ripple frame w/gilded sight and beautifully made wood divider with 12 ninth plate ambrotypes. The quality of the woodwork on the divider is superb. It is 14 x 16 1/4 inches od. and each image area is 2 x 2 1/2 inches. Best - These "Ripple" frames are among my favorites. They were only made for a few years and are very difficult to find. They are based upon the 17th century Dutch Ripples. The early Dutch pieces have a smaller, tighter spaced ripple. 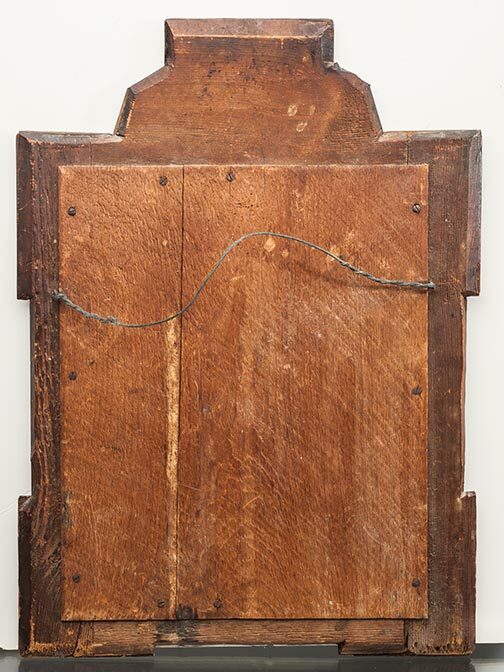 This is a Ripple piece from the 1830s. It is 16 x 19 1/2" od. Best - Rippled, gesso covered from the 1830s. It is 11 x 15 1/8" od. 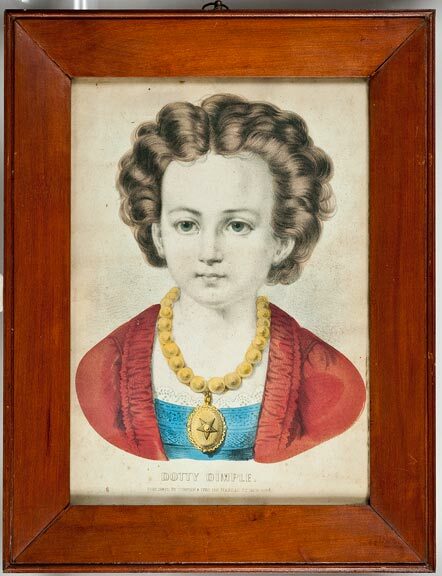 Best - Heavy, rippled piece from the 1830s. 16 3/4 x 21 3/4" od. 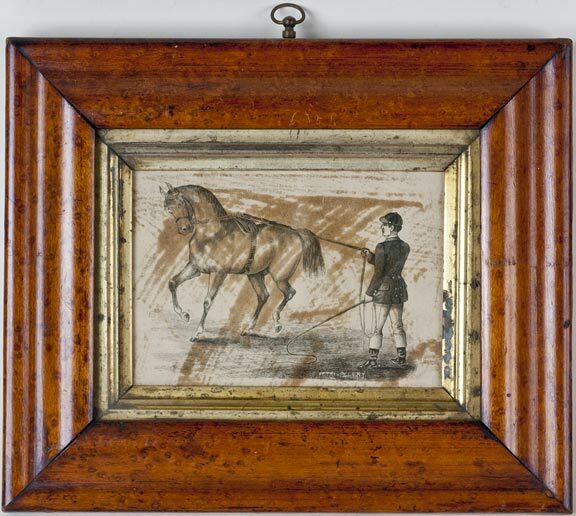 Best - Another heavy, rippled example from the 1830s. 16 3/4 x 22 1/4" od. Best - This is a rarely seen brown Ripple example w/gilded sight from the 1830s. It is 17 1/2 x 23 1/2 inches od. and has a 14 x 20 inches picture size (rabbet). 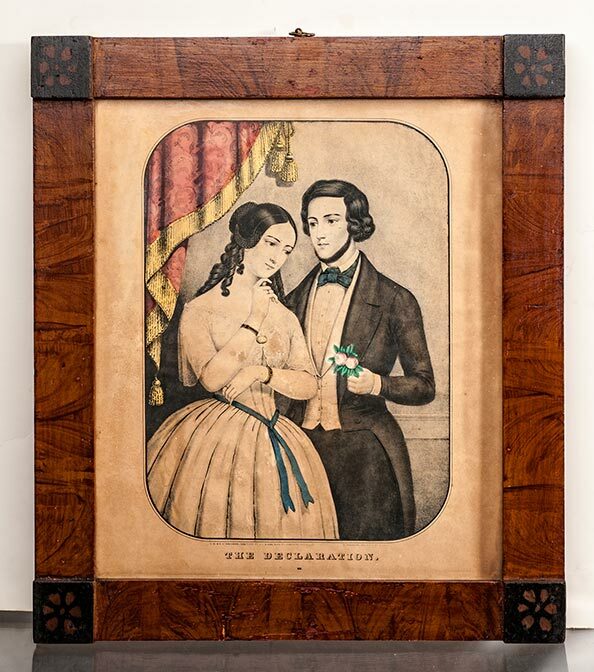 Best - An attractive, carved, solid wood piece from the 1840s-1850. 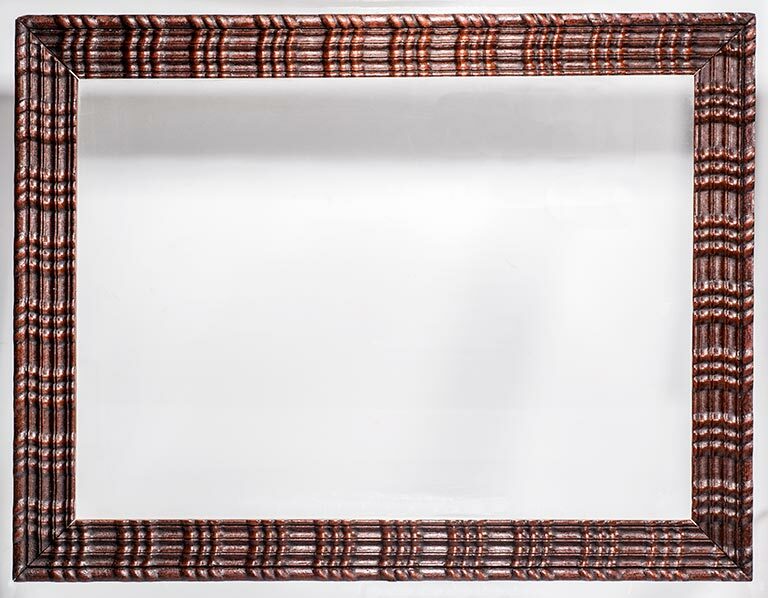 This high quality frame has a mahogany carved solid top backed in pine. It was found in Canada and may have originated in Canada or the upper US states. It is 14 5/8 x 19 1/8" outside and a 12 x 16 1/2" image size. 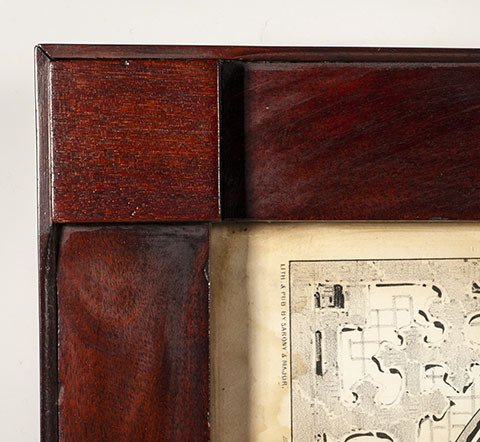 Better to Best - A mahogany veneer piece with a double beaded edge from the 1830s-1840s. It is 7 1/2 x 8 3/4" outside and has a 4 3/4 x 5 3/4 image size. 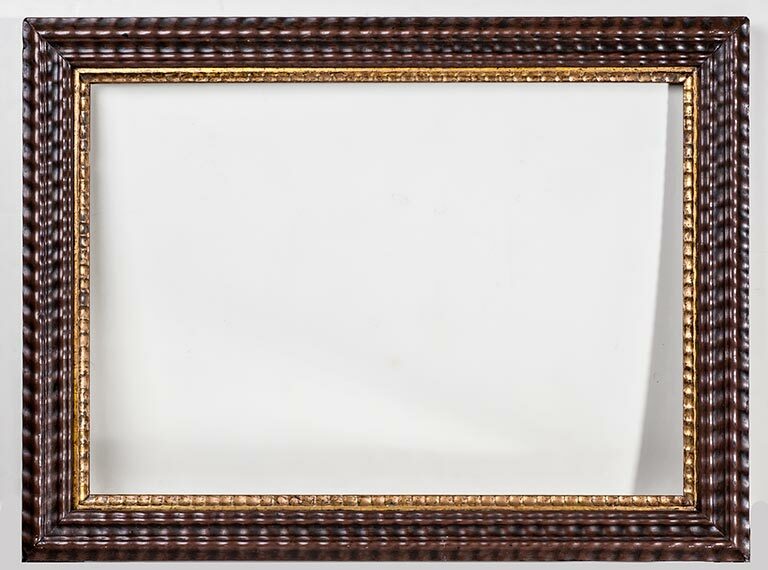 Best - A mahogany veneer example with a double beaded edge from the 1830s-1840s. 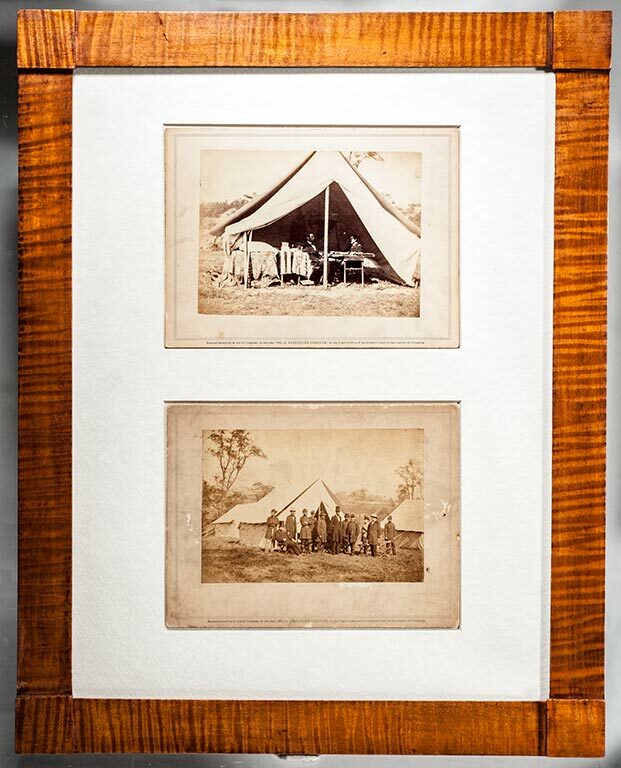 It is 15 3/8 x 19 1/4" outside and has an 11 x 14 3/4" image size. Best - A superb faux bois finish from the 1830s-1840s. It is 10 1/4 x 13 3/4" outside and has a 7 1/4 x 9 3/4" image size. Best - Another great faux bois finish from about 183-40s. It is 13 1/2 x 17 1/2" outside and has a 10 x 14" image size. 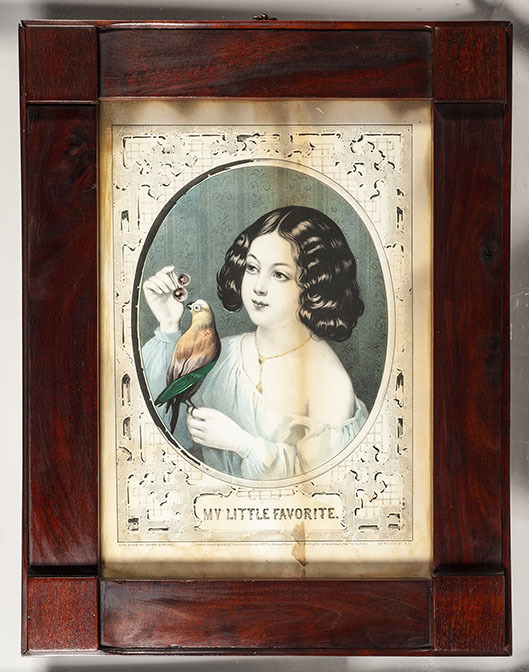 These folk art pieces are extremely tough to find. 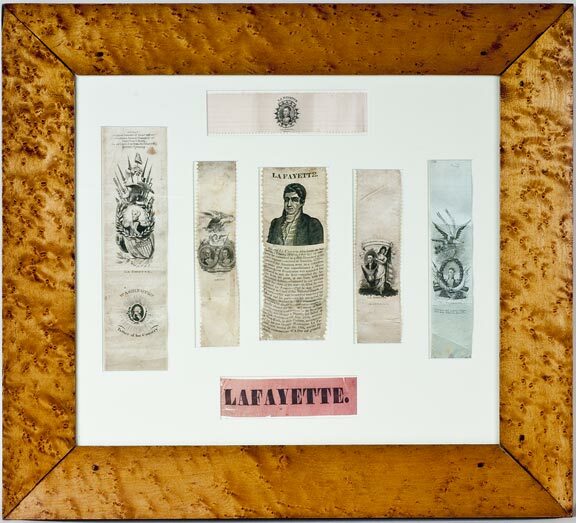 They are prized for exhibiting samplers, folk paintings, and early paper items. 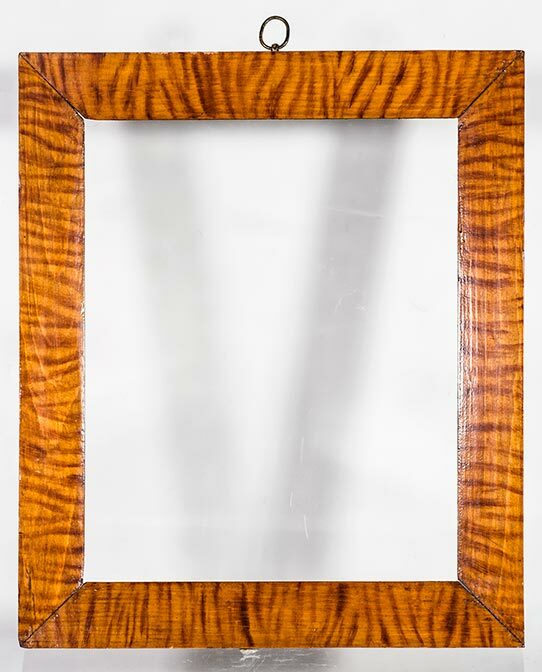 Best - A superb tiger stripe faux bois, hand-painted finish from about 1840. It is 10 3/4 x 12 7/8" with an 8 1/2 x 10 1/2" image size. 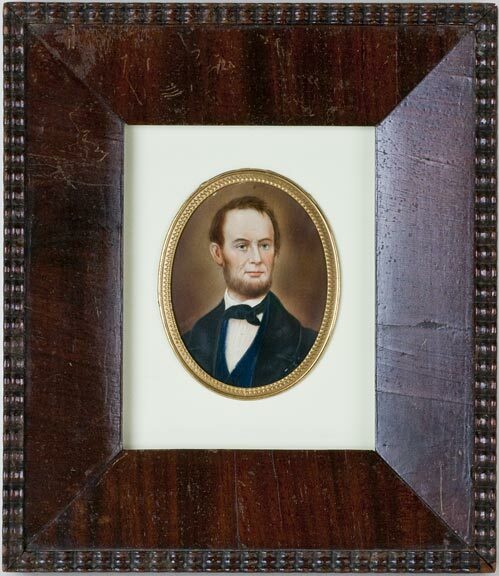 Better - A higher quality pine piece from the 1840s-1850. Note the separate piece, raised boarder, a sign of higher quality. 13 3/4 x 17 3/4" outside and 10 x 14" image size. 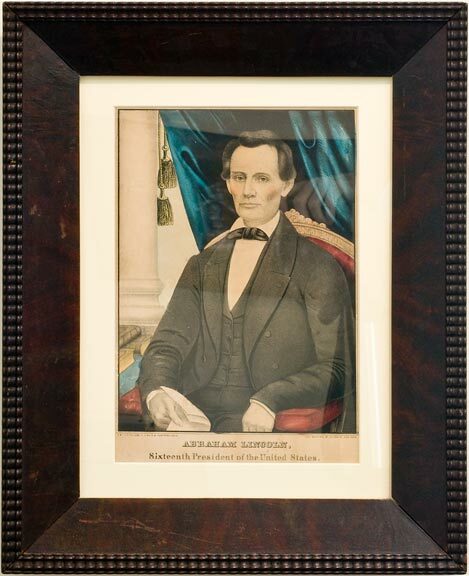 Best - A superb, Amish country, Pennsylvania hand painted, faux bois- piece from about 1830-40. It is 11 1/8 x 13 5/8 inches od. and has an 8 1/2 x 11 inch image size. Found in Pennsylvania. Good to Better - A simple red-painted piece from the 1830-40s. 12 1/2 x 16 3/8" od. 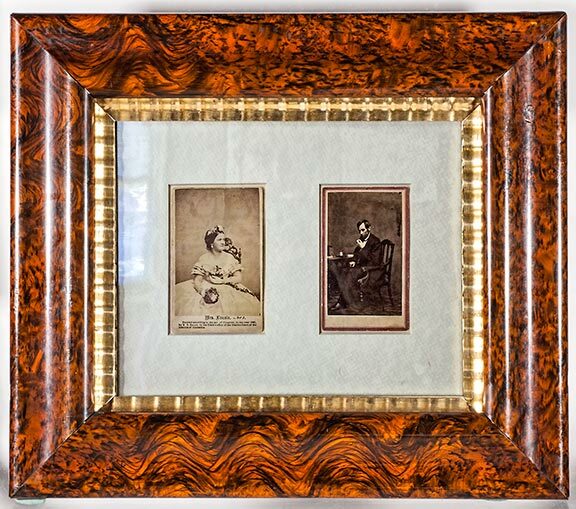 Early colored, simply-finished frames are very much sought by primative collectors Better - A beautifully grained faux bois style from the 1840s. 12 1/2 x 16 3/8" outside and 10 1/8 x 14" image size. 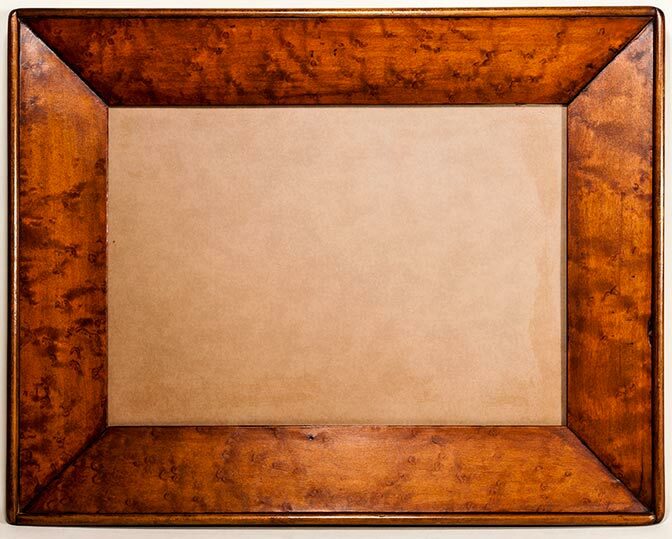 A simple mahogany veneer example from the 1840s. It is 15 1/4 x 18 3/4" od. 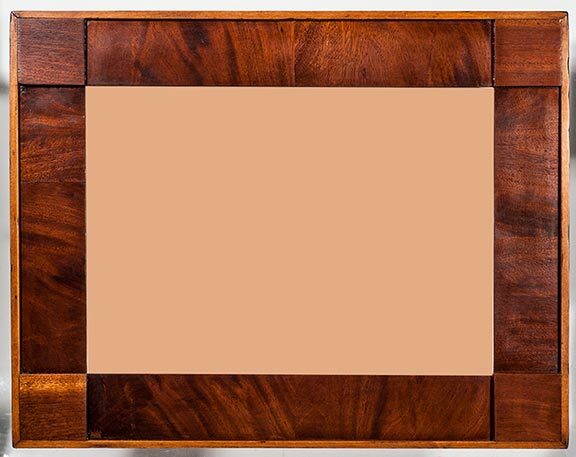 A higher quality mahogany veneer finish from the 1840s. 15 1/8 x 19 3/4" outside and 10 x 14 1/4" image size. Copyright 2015-2019 by Stuart Schneider. Do not use any parts of these pages without written permission.